Well, this was just an absolutely adorable, cute and relatable story that is perfect to read in one sitting or to help you get rid of a reading slump. Which makes this two wins for Becky Albertalli and definitely made her an auto-buy author for me! Need some more convincing? Here’s a list of everything to love about it! The diversity! Oh, the diversity! This was just so exquisitely done and I feel like every book should be written like this. I mean, we have here lesbian characters, a pansexual character, (minor) gay characters, black characters, a bi-racial character, Jewish characters, underrepresented body types and anxiety rep. Also, Molly has two moms. Which is all great, but the best part is that it all feels super natural. None of these characters felt written in just to be able to tick off a box. I adored this so, so much and can only applaud it and ask for more! Molly. Molly not only felt like such a relatable character, but also like a real teenage girl. Sure, she has her flaws, but she also reminded me so much of me at her age. Her huge amount of crushes (one of which is Lin-Manuel Miranda, which is just adorable and amazing and made me smile so badly), her insecurities about her body or about being left behind felt so real. And even though she has her insecurities, she’s also who she is and doesn’t just take any crap, which was just inspiring. The family scenes. Especially Molly’s two moms. They were just so present and cared for their kids so, so much and I loved every little scene where one or both of them had a talk with their kids. They also felt so fleshed-out and developed, not just your standard YA parent, which I loved. The Abby and Simon cameos. I loved that this story crossed over a bit with the Simon story, in that Molly and Abby are cousins and we get a lot of Abby here as well. But my favorites were of course the small Simon cameos which immediately brought back that Simon-induced smile. Though they are of course two separate stories, I would still recommend reading Simon before reading The Upside, if only because the cameos would be pretty meaningless if you don’t. The food appreciation. Let’s be honest here – though romance is cute and all and a lot of us can relate to unrequited crushes, I think we can ALL appreciate good food. I don’t know why I love reading about people loving food (in this case, mostly Cadbury mini eggs), but it’s true: food love makes me swoon. Though I must admit – even though I loved this, I also wasn’t as over the moon in love with this as I had hoped or even already expected. Why that is, I can’t 100% accurately pin-point. Overall, I just enjoyed this less than Simon vs the Homo Sapiens Agenda, which is why I gave it one star less. Mostly, I think this was because I couldn’t quite connect to the side characters. I did love Molly and related to her intensely, but some of the other characters felt just a tiny bit underdeveloped to me. I liked Reid, but I wish we had more scenes with him and just got to know him better. Same with Mina, Will and Olivia. And some side characters, like Cassie or Max, I just didn’t really like at all (sorry!). Though, that is me nitpicking here. Because seriously, this story was not only cute and adorable, but also super relatable and diverse. The perfect read for when you’re looking to get out of a reading slump or even when you’re just looking for something to read a day away with. 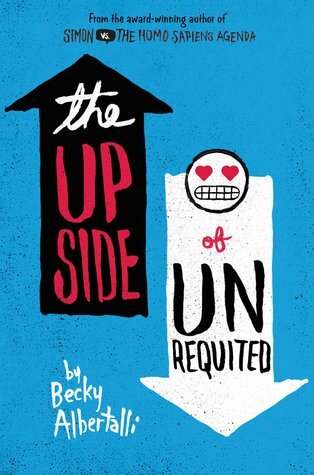 Have you read The Upside of Unrequited? What did you think about it? I got this in my uppercase in March. I really need to push it up my TBR. Hopefully soon. This sounds like a really sweet book, and I’m so glad that the diversity was integrated so seamlessly. Adding to that very real and vivid characters with relateable thoughts and problems!? AWESOME. Simon V is actually on my TBR so I really need to get to it, especially after this review! Great one! AGDHDHDBDHHDLKJKLLK!! That’s my reaction after reading your review! For someone who has read a sum total of 7 contemporaries in her life, I sure am adding a lot to my TBR of late and this is definitely going in <3 This sounds so cute and AHHH!! All that diversity <3 I'm in love and I haven't even read the book yet 🙂 😀 Great review Lindsey!! OMG, I’m so happy you added this to your TBR! I think this is definitely one of those books that deserves a spot on the contemporary TBR. 🙂 I so, so hope you’ll love it!